New York, the city. New York, the magazine. A celebration. The great story of New York City in the past half-century has been its near collapse and miraculous rebirth. A battered town left for dead, one that almost a million people abandoned and where those who remained had to live behind triple deadbolt locks, was reinvigorated by the twinned energies of starving artists and financial white knights. Over the next generation, the city was utterly transformed. It again became the capital of wealth and innovation, an engine of cultural vibrancy, a magnet for immigrants, and a city of endless possibility. It was the place to be—if you could afford it. Since its founding in 1968, New York Magazine has told the story of that city’s constant morphing, week after week. Covering culture high and low, the drama and scandal of politics and finance, through jubilant moments and immense tragedies, the magazine has hit readers where they live, with a sensibility as fast and funny and urbane as New York itself. From its early days publishing writers like Tom Wolfe, Jimmy Breslin, and Gloria Steinem to its modern incarnation as a laboratory of inventive magazine-making, New York has had an extraordinary knack for catching the Zeitgeist and getting it on the page. It was among the originators of the New Journalism, publishing legendary stories whose authors infiltrated a Black Panther party in Leonard Bernstein’s apartment, introduced us to the mother-daughter hermits living in the dilapidated estate known as Grey Gardens, launched Ms. Magazine, branded a group of up-and-coming teen stars “the Brat Pack,” and effectively ended the career of Roger Ailes. Again and again, it introduced new words into the conversation—from “foodie” to “normcore”—and spotted fresh talent before just about anyone. 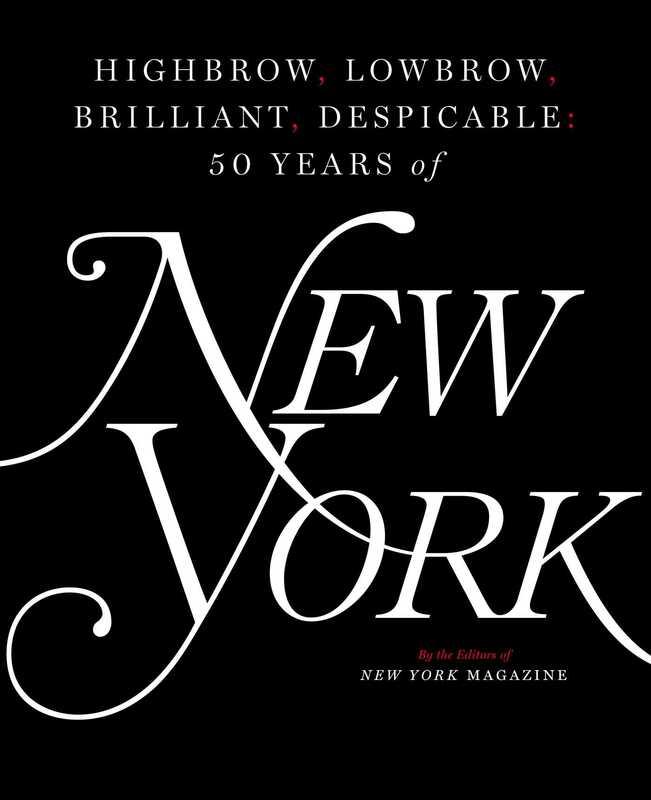 Marking the magazine’s fiftieth birthday, Highbrow, Lowbrow, Brilliant, Despicable: 50 Years of New York draws from all that coverage to present an enormous, sweeping, idiosyncratic picture of a half-century at the center of the world. Through stories and images of power and money, movies and food, crises and family life, it constitutes an unparalleled history of that city’s transformation, and of a New York City institution as well. It is packed with behind-the-scenes stories from New York’s writers, editors, designers, and journalistic subjects—and frequently overflows its own pages onto spectacular foldouts. It’s a big book for a big town.